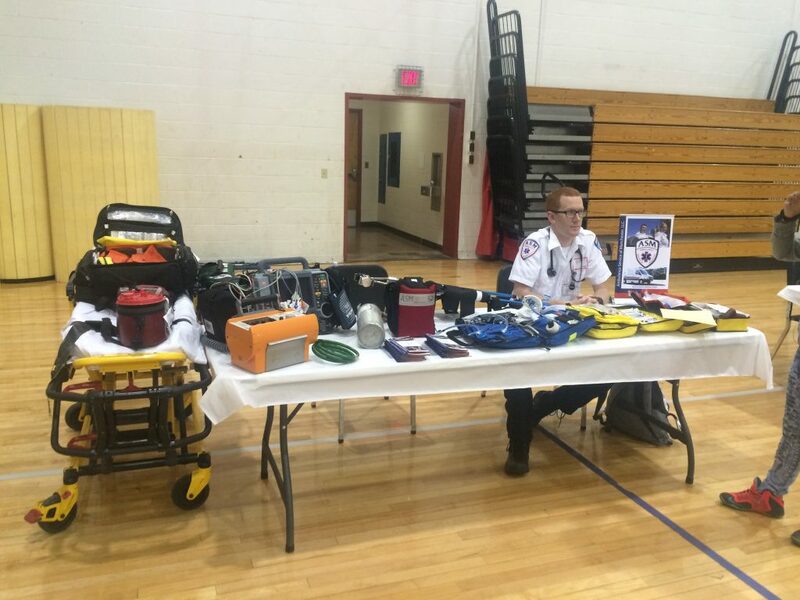 MANCHESTER — On May 24, 2016 ASM’s Billy Schnepp and Brian Langan attended a Health Fair at Manchester High School to talk to students about about emergency medical services as a health-related career and the role of Paramedics and EMTs during medical emergencies and within the health system. HARTFORD — On May 18, 2016 Aetna’s TJ Wain and Sean Howard attended MD Fox School’s Career Day to talk to 8th grade students about EMS as a career, Paramedics and EMTs, and medical emergencies. According to organizers, the focus of Career Day was to expose 8th graders to different careers that may interest them. Caring, Respectful. They instantly made me feel like everything was going to be okay. The two people were just so wonderful, extremely concerned and empathetic. (16-29487; J. Pearson, K. Stewart). I was very impressed with the professionalism and care. Keep up the great work! (16-29485; R. McConville, T. Luetjen with Manchester Fire Rescue EMS). Great guys. The EMTs came back after my [procedure] to see how I was doing. That meant a lot to me. I can’t thank them enough for their help. (16-28750; S. Gregg, A. Hernandez with Manchester Fire Rescue EMS). Very skilled and caring! Thank you! Men were excellent, caring, professional. Well educated. Good job accomplished. (16-30579; J. Shapiro, M. Bouley). Very professional, good sense of humor while providing excellent care. (16-30776; B. Langan, J. Craig). The [crew was] wonderful to my husband! (16-30557; E. Sheils, A. Linardo). Assured me I’d be ok (well cared for). The crew were so good. The ambulance crew could not have been kinder or more comforting. I was grateful. (16-31261; M. Tuttle, J. Startup). I felt that they did everything in a professional manner and greatly helped me relax. I felt safe + secure! Thank you. (16-32106; G. Geres, C. Haag). Medics were very kind, considerate and made me feel very comfortable on my first ambulance ride. Caring and highly professional. They made my five year old feel very comfortable and no scared! (16-31973; G. Geres, C. Haag). Professional and caring. I have never been transported by an ambulance. I was a little anxious, however the team eased my worries. I appreciated their personal and professional care. (16-24253; K. Caldwell, C. Masslon with Manchester Fire Rescue EMS). Saint Francis Hospital: juice, coffee and tea available all day. 0730-1030: Saint Francis Hospital Emergency Department: Hot breakfast buffet. 0800-1600: ECHN EMS Lecture Series: New topic every hour on the hour, to be held as ASM at 275 New State Road, Manchester. RSVP to nbrunet@echn.org. 1000: The staff of OEMS will join the Council of Regional Chairpersons (CORC) in celebration of the annual EMS awards at the State Capitol. All are welcome. THe Ceremony will take place in the Old Judiciary Room and will honor individuals and services from throughout Connecticut. Hartford Hospital has fresh fruit in the EMS room and an EMS Week gift at EMS Education. 0730-1200: Hartford Hospital, EMS Week Symposium, ERC 221. 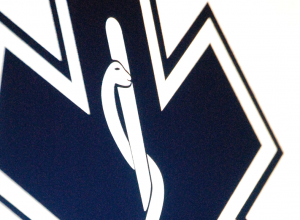 A multidisciplinary group of physicians deliver engaging, EMS-specific presentations. There is no charge. All levels of provider are encouraged to attend. 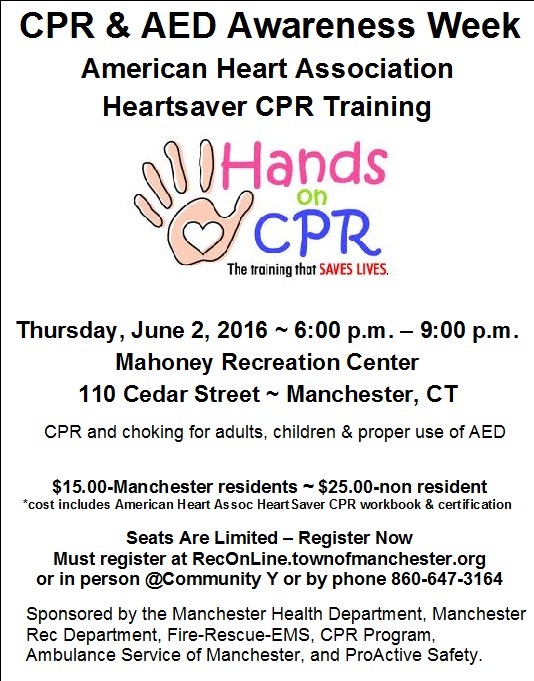 You may register by contacting HH EMS Education directly at emseducation@harthosp.org. 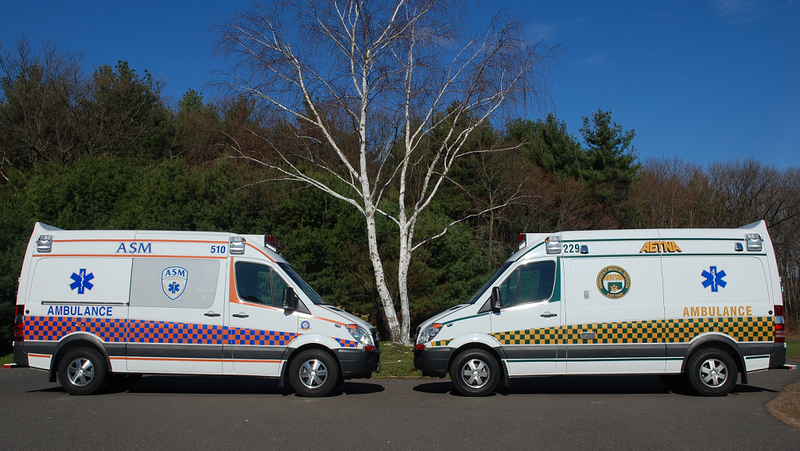 1330: Hartford Hospital, EMS Week Symposium, ERC 221, practical lab. 1800: Johnson Memorial Medical Center BBQ. CME follows BBQ at CMEC Amphitheater (the building on the right as you enter the main hospital driveway), 201 Chestnut Hill Road. 1130-13300: Saint Francis Hospital, Emergency Department: Burrito Buffet Lunch. 1730-1900: Hartford Hospital (outside of Conklin Building) Annual Cook-out. 1800: Greater Hartford EMS Bowling Night: Callahan’s Bowl-a-Rama in Newington, Special Price, RSVP to John Quinlavin or Rich Antonelli by May 15th. 0700-0900: Aetna and ASM employees are invited to ASM’s conference room to meet and speak with representatives of MassMutual, Edge Fitness and a dietitian as part of our commitment to total employee health. Hartford Hospital EMS Room: Fresh fruit available. 1700-1900: Saint Francis Hospital, Emergency Department: Burrito Buffet Dinner. 1730: Saint Francis Hospital Emergency Department: Annual EMS Champion Award. 0700-0900: Hartford Hospital EMS Room: Join us for breakfast. If your organization, facility or agency is having an EMS Week event in the greater Hartford area and you do not see it listed here, please email it to a member of our management team, fill out the contact form, post it as a comment or email it to us at info@asm-aetna.com. 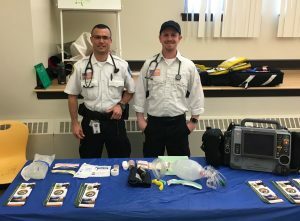 SOMERS — During early May 2016, ASM Paramedic Billy Schnepp and his partner Brian Langan responded to a medical call in Somers, CT. 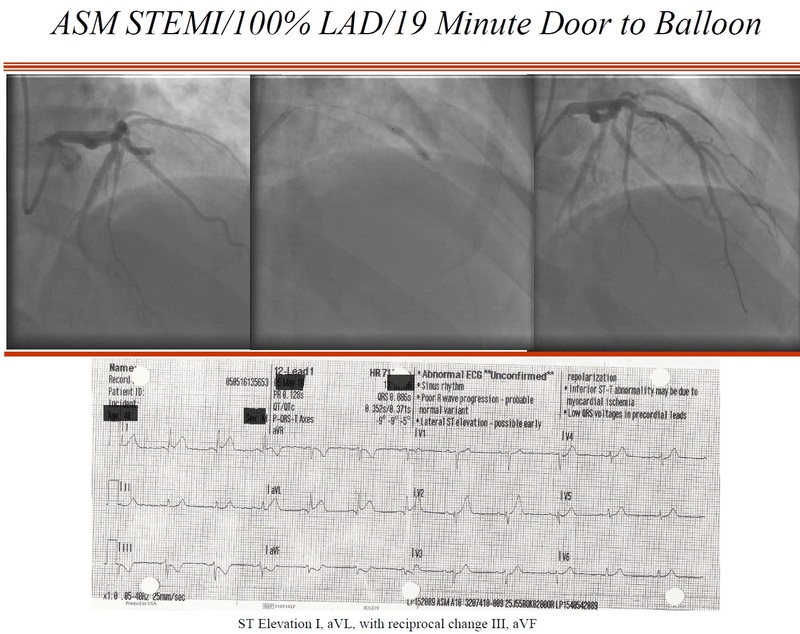 The EKG was indicative of a STEMI and Billy wirelessly transmitted the 12-lead EKG to UConn Health in Farmington, activating their cardiac catherization lab from the field. (#16-33635). A 12-lead ECG revealed a high lateral STEMI. Schnepp consulted with medical control for destination due to patient’s requested choice of PCI center, and received permission to transport to UCONN John Dempsey Hospital. Due to concern for potential patient deterioration, Schnepp received intercept help from Windsor EMS paramedic Wayne Cabral. Schnepp called in a STEMI Alert from 33 minutes out. 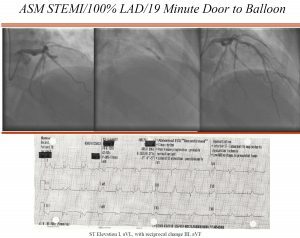 When they arrived at the hospital, thanks to the early notification, the patient was taken directly to the cardiac cath lab on the EMS stretcher where Dr. Michael Azrin and team found a 100% acute thrombic occlusion of the patient’s mid left Anterior Descending Artery (LAD), which was successfully cleared and stented, restoring perfusion. The patient is doing well, thanks to the great job by the EMS/Hospital STEMI team! R.N., Patricia. Weigle, R.N. , Patty Fagan, R.N., Shelia LaFleur, R.N. Positive, gentle, kind, ie wonderful! (16-22822; T. Wallace, J. Craig). They moved quickly and met all my needs. Kind, caring, very capable and professional. (16-23554; R. Balkun, A. Cichy). Everyone seemed to know exactly what to do. Polite, courteous, knowledgeable, friendly, reassuring + just wonderful! Did their job perfectly. (16-23731; S. Crittenden, J. Bush). Experienced, empathetic, skilled, resourceful + professional. Very comforting. I felt safe putting myself in their hands to deal with my injury. (16-22905; R. O’Neil, B. Langan). The EMT was exceptional; both caring and concerned. They locked my house, got my cell and keys. True professionals. (16-26161; J. Lentini, J. Startup with Manchester Fire Rescue EMS). Safe and consider. Went the extra mile. Good job. Keep up the good work you do. Professional and caring people. I loved the treatment and kindness they showed me. (16-28797; S. Gregg, A. Hernandez). Very kind + put me at ease. Everyone courteous and professional at my home. Caring, kind and respectful. (16-23168; M. Osborne, M. Uddin).